You haven't read much about Assassin's Creed Rogue around these parts because it's being developed exclusively for consoles, which puts it a bit outside the purview of a site called PC Gamer. But as Ubisoft revealed last month, that situation may change in the relatively near future. Assassin's Creed Rogue applies an interesting twist to the familiar formula by putting players in the boots of Shay Patrick Cormac, an Assassin who switches sides to become a Templar after a betrayal at the hands of the Brotherhood. "This is something we've thought about all the way since AC1. What would it be like to play as a Templar?" Associate Producer Karl Von Der Luhe said in a Uplay interview. "We think it's really powerful, both in gameplay and storyline [and] premise. 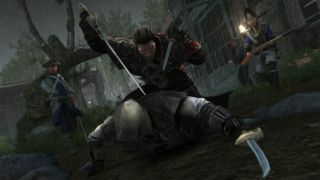 Shay Patrick Cormac will go through a very emotional journey from being an Assassin to being a fully-fledged Templar, and we want the player to go through a similar journey." But if you want to embark on that journey, you'll need either an Xbox 360 or a PlayStation 3, since there's no word of a PC release. It's an odd omission, especially since the upcoming Assassin's Creed Unity is being developed for the PC (as have all previous console-based AC titles), but it's also one that may eventually be rectified. "The game is being developed for 360 and PS3," Von Der Luhe continued. "We've heard a lot of response requesting a PC version, so we'll be looking into that very soon." It's not exactly a rock-solid confirmation, but given Ubisoft's relentless sequelization of Assassin's Creed and the fact that next-gen console versions of Rogue haven't been announced yet either, I wouldn't be surprised to hear about a PC version by the end of the year. Both Assassin's Creed Rogue and Assassin's Creed Unity launch in November.